Meadowbrook Resort in Wisconsin Dells is a rustic lodging place in the Dells offering a Northwoods nature experience while keeping you close to the water park action and Wisconsin River scenery. Just minutes away from the rides and attractions of Wisconsin Dells the Meadowbrook Resort offers an alternative to the hubbub of larger water park hotels with its “Timber Camp Water Playland”, a series of themed indoor and outdoor pools, slides and games. Accommodations consist of deluxe rooms and cabins in different suite styles, some with kitchens, fireplaces and whirlpools to suit any group, couple or family. 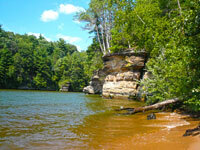 The Meadowbrook Resort is sure to make your vacation in Wisconsin Dells unique and memorable. This was a horrible hotel! The packages they offer are not what they make them out to be. A total waste of time and money! The hotel is rundown and stinks! The workout and game room should not even be listed on the brochure. Worst I’ve ever seen. The employees act like they don’t care that they completely misrepresent the activities available. They don’t even refund if it’s their fault! If you’re looking for a family vacation or weekend getaway don’t come here! Major disappointment.